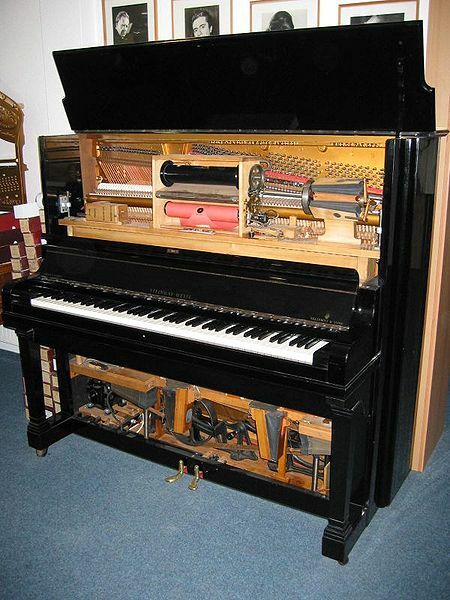 One can scarcely discuss nowadays the merits of pianos in our homes without mentioning in connection with them the latest development of modern musical invention, the mechanical piano players. Some musicians affect contempt for the mechanical piano players and ridicule their value, but I do not agree with this view, for, though, no doubt, they cannot be said to contribute to the highest realms of musical expression, still I think they possess a very real value in that they educate the public taste, and enable people who would otherwise have no inclination or impulse to hear good music to become familiar with it. Therefore, let us not disparage the mechanical piano-players, even though they are trying neighbors in the next house when one is working or sleeping. Of course, it is not quite the same thing, choosing a piano for one’s private use, or selecting the Concert Grand from a professional point of view for a performance in a big hall. For instance, when I give a recital my piano is selected by me and my piano-maker some weeks before the concert from several special ones which I am in the habit of playing. It is tested as to its power of tone and resonance with reference to the acoustical properties of the hall. It is tuned, the action regulated, the pedals adjusted in fact, it is prepared and brought into perfect condition, like a well-trained racehorse before it starts its race, so that it may be equal to all the demands imposed upon it. If I were going to buy a piano for my own house, what should I look for? I should first of all search for one with a good even tone throughout, as well in the treble and bass registers as in the middle. Next, I should try the action by ascertaining if the keys repeat perfectly and whether the touch is easy and pliable under the fingers, and also whether the pedals act promptly But, as I have said before, it takes real knowledge to judge such things oneself. If one has not had the opportunity of experience, the next best thing is to go to a first-class firm where only first-class instruments are kept and are looked after by experts. And now, as a fitting finale, let me once more myself eulogize my beloved instrument and let me emphasize again what a wonderful work of human ingenuity it is. Who can but marvel when he hears the variety of its effects, the power and wealth of sound it possesses, its wonderful mechanical soul, the pedal, how it is able to produce such great emotions, tears, laughter, excitement, enthusiasm. It can give at the same time complete satisfaction to those of its unambitious devotees who seek only to pass away a few pleasant moments in evoking charming sounds and yet prove its stimulation as an instrument of superhuman difficulty and interest to those who desire to master it, and make it disclose all the richness and extent of its possibilities. And for such as are not easily tired or discouraged, the piano can be a glorious friend and companion, only they must have the will and perseverance, and above all talent and temperament, to inspire the instrument with life and master its secrets.